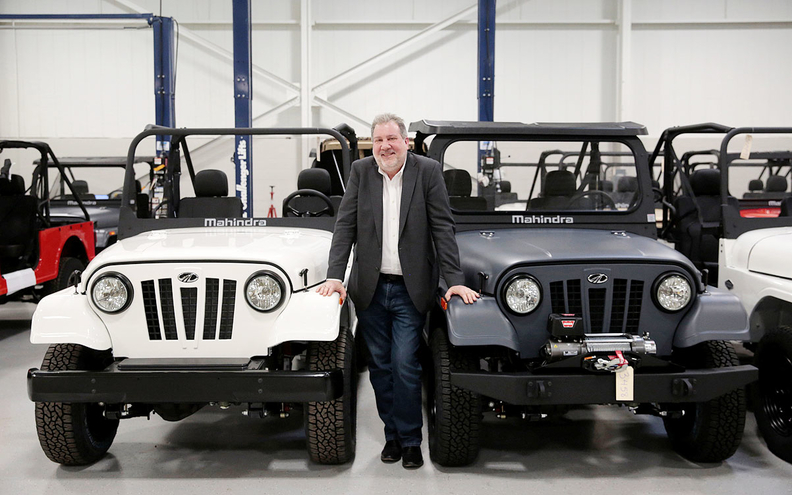 Mahindra's U.S. efforts are being led by Rick Haas, a former executive at Ford Motor Co. and Tesla Inc.
DETROIT -- "Warning: Don't do anything stupid!" reads the sign to the right of Rick Haas' office computer. 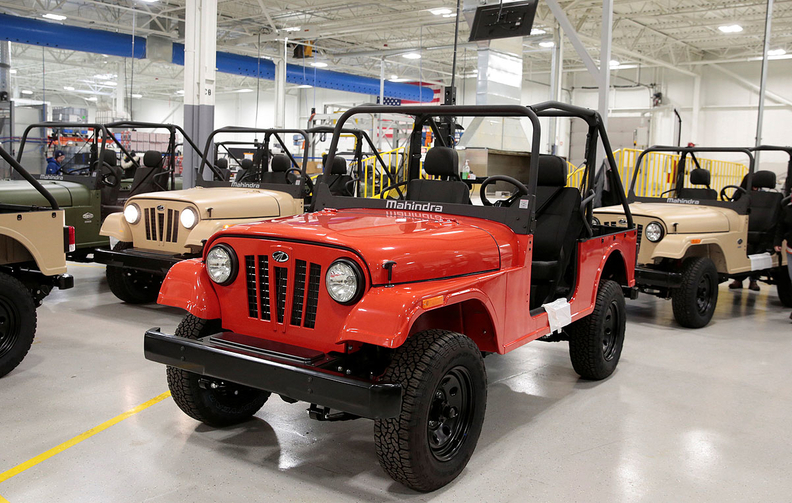 It is the same tongue-in-cheek warning affixed to the dashboard of every off-road Mahindra Roxor vehicle that Indian automaker Mahindra and Mahindra Ltd. assembles in a suburb north of Detroit. The motto might also apply to the Indian automaker's latest attempt to enter the U.S. auto market -- an effort being led by Haas, a former executive at Ford Motor Co. and Tesla Inc.
A decade ago, Mahindra tried to break in to the U.S. market with a low-cost pickup truck. The foray ended in failure and protracted litigation with dealers demanding their franchise fees back. Haas, the automaker's North American chief executive, says this time Mahindra has a more cautious "pay-as-you-go strategy." Instead of starting with a truck or passenger car, Mahindra is reintroducing its brand with the Roxor, a vehicle that looks like a vintage Jeep. Mahindra has built around 3,000 off-road Roxors and is using the model, which starts at around $15,000, to demonstrate to American consumers and dealers "acutely aware of our previous experience" here that the Indian automaker can build a reliable product before it launches mainstream models for use on American roads, Haas told Reuters. "Getting burned makes you cautious," Haas said. Roxor off-road vehicles are seen in the Mahindra Automotive North America assembly plant in Auburn Hills, Mich., in a Jan. 30 photo. France's PSA and China's Zotye and GAC all have outlined plans for establishing beachheads in the world's second-largest market by sales, which offers rich pickings in segments including pickup trucks, SUVs and crossovers. See graphic on annual U.S. new car sales. "There's not a line waiting out the front door of every potential newcomer to North America of people saying 'I cannot wait for a new car to show up here today,'" said Larry Dominique, North American head of PSA, which also has taken a cautious approach to relaunching here. PSA announced last month the Peugeot brand will lead its U.S. return -- the same brand that crashed out of this market less than three decades ago. Analysts and auto executives say new entrants must stand out in a crowd to crack the U.S. market, as Tesla has with electric vehicles. "If you fail to deliver on that then you’re a pariah in the market," he said. Prospective U.S. entrants might look to the example of South Korean automaker Hyundai Motor Co., the last foreign automaker to successfully enter the U.S. car market. The Korean carmaker launched cheap models in the United States in 1986, as Toyota Motor Corp. and Honda Motor Co. had done before. Hyundai scored early successes, but quality problems set the brand back, and forced a relaunch. Now, it is overhauling its U.S. strategy, shifting from sedans to crossovers. Mahindra's first foray into the U.S. auto market was a disaster, as plans to launch a low-cost pickup with high fuel efficiency never came to fruition, in part because it failed to meet federal emissions standards. Angry dealers who had signed on to sell the Scorpio pickup sued Mahindra in 2012, but in 2014 failed to win class-action status. Mahindra regrouped. Haas set up Mahindra's U.S. office in 2013 with just a handful of people, and that has risen to 450. The Roxor also has caught the eye of the owner of the Jeep brand, Fiat Chrysler Automobiles, a potential competitor whose U.S. headquarters is just up the road from Mahindra's. Last August, FCA asked the U.S. International Trade Commission to block Roxor sales because the model is too similar to its own Jeep. The commission has ruled FCA can pursue its intellectual property claims against the Roxor, but on Feb. 21 Mahindra asked the agency to review that ruling. "I can't say what our plans are, but the smoke is going to clear out of the air in the next year to 18 months," Haas said. Among the vehicles under consideration for the U.S. market is the new Marazzo, a minivan designed by Mahindra's Michigan engineers for sale in India that has scored well in international crash safety tests and features Apple CarPlay. Instead of low prices, Mahindra plans to focus on its image of building rugged, durable vehicles for India's roads. "We're India tough," Haas said. "That's a value that resonates with a chunk of the population here." The speed of Mahindra's U.S. rollout will depend not only on retail consumers but the U.S. Postal Service, Haas said. The Postal Service is searching for its next generation of delivery vehicles and Mahindra is one of five finalists for the $6 billion project, which may be decided this year.